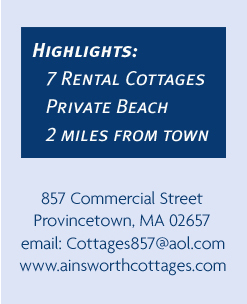 Josh and Ruth Ainsworth first came to Provincetown, MA in June of 1952 to manage summer rental properties as a favor for a friend. Josh, a college professor at Lowell Technological Institute, now known as UMass Lowell, wanted to supplement his income and spending summers in Provincetown and managing cottages provided the opportunity to accomplish that goal. 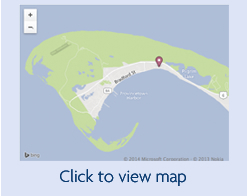 It also enabled Josh and Ruth to work together while staying close to their young family and afforded their children, and much later their grandchildren and great grandchildren, wonderful summer experiences of sun, sand, and sea on Cape Cod. In 1957 Josh and Ruth took the bold step of purchasing five cottages and Ainsworth Cottages came into existence. Under their first five year	stewardship, there were more potential guests than there were cottages and they reached the conclusion that they needed another rental cottage. 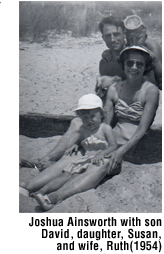 Therefore, once the college semester ended in June of 1958, Josh and Ruth returned to Provincetown with their family and they worked morning until night to build	a sixth cottage. The very first guests of this “New Cottage” arrived on Saturday, August 2, 1958, just hours after the finishing touches had been made. Ruth was the consummate perfectionist! 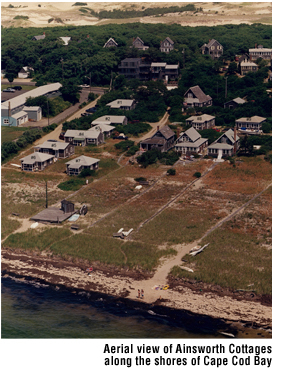 Three additional cottages were purchased and added to the property prior to the opening of the 1960 summer season. 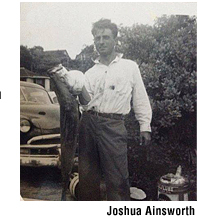 Every summer from 1952 until his death in 1988, Josh Ainsworth came to Provincetown to manage and maintain Ainsworth Cottages. Every summer from 1952 until her death in 2013 at the age of 100, Ruth Ainsworth arrived at Ainsworth Cottages to manage, oversee and supervise all aspects of operating the cottages. Josh and Ruth worked hard and devoted their energies to providing their guests with affordable and memorable summer vacations. 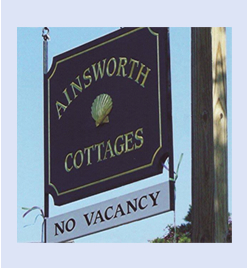 The Ainsworth family is now in their fourth generation and the children and grandchildren of Ruth and Josh are currently managing and operating the cottages. People from as far away as Australia, New Zealand, England, Scotland, Wales, Ireland, France and Germany have spent time in the cottages. We even have the honor of being able to say that a Nobel Peace Prize recipient and his lovely wife and family stayed at Ainsworth Cottages every summer for many years.